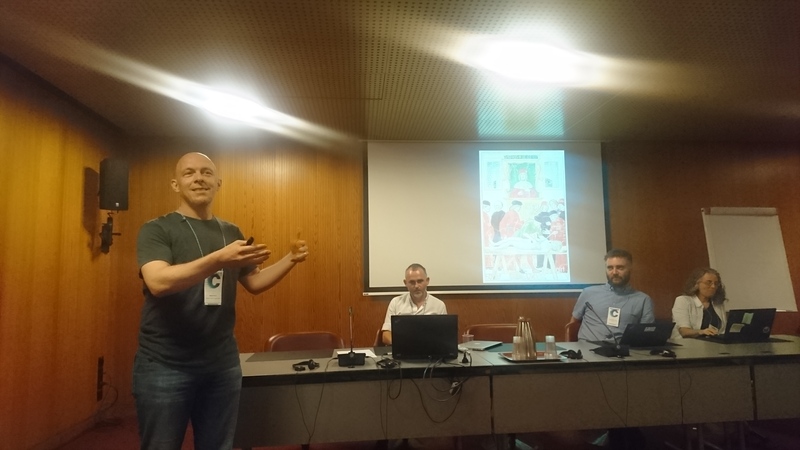 The Ecsite conference took place in Geneva from the 7 to the 9 June. It followed the ECSA conference (or more accurately, ECSA conference was set to coincide with Ecsite). The conference theme was “creative collisions”. The conference was opened by the director of Geneva’s Natural History Museum Jacques Ayer. Organising an Ecsite conference is a crazy adventure – but enriching. Science and the transmission of knowledge are important and it at a risk of dealing with ignorance. By reimagining science and its communication, we can deal with the pressure on science from different directions. The richness and beauty of the world come from its diversity and we need society to appreciate it. The Mayor of Geneva Sami Kanaan – Geneva have a long history of science, including the academy that was set by Calvin, which became the university and it is central to the city. Scientists left us knowledge and that is managed in the Natural History Museum and the Botanic Gardens – they belong to the city, and therefore to the citizens. They also active in sharing the science with the wider public. Geneva’s citizens are involved and curious – and they use every opportunities to engage with it, including the science night in July in one of the central park. It is a city of dialogue – it specialised in bringing people to organise new norms to organise society. They are interested in the role of science and technology in the life of the city. Thierry Apotheloz – Geneva is the land of sciences from Jean Piaget, Jean Jacque Rousseau. Geneva is also important in the Natural Sciences, and it is been a welcoming place for dialogue and collaboration. Geneva always attributed knowledge as important in its progress, Making science publicly accessible is a mission that the politicians in the city are seeing as very important. We need to maintain social cohesion for democratic functioning – science collides with charlatanism, fake news etc, we need science that is open to the world and respond to it. We need scientists to leave their lab and classroom and go out, this is a critical for societal missions. Herbert Munder (Ecsite president) – in the conference there are about 1000 participants. In the early 1990s, the opening up to the science – more informed public is more sceptic and critical of research and understood that need to listen and have a dialogue with the public, and then a growth of co-design. The general public is expected to accept scientific finding, but now we experiencing politicians who are not believing in science. Are we back in the 19th and 20th centuries? There is a wide networks of science communication expertise that can address it, there are global challenges and need to address them across the world through network. We have to work together at a European level but we don’t know the challenges and the lack of acceptance of complex model that has been accepted a while ago. There is an effort to ensure funding through programmes such as Horizon Europe. Catherine Franche – Fact don’t change beliefs, should we change other people language or should we speak other people’s language. Science communicators need to provide the link and the ability to discuss the values that are being integrated into innovations. We need to think about the ongoing changes in society, and we need to offer dignity to everyone in the world and consider how the Sustainable Development Goals are part of our goals. Philippe Moreillon – the Swiss Academies of Natural Science, followed a rich history in scientific research in Lausanne, and science means knowledge without discrimination – natural science, humanities and social knowledge should be all respected. Ecsite mission of communicating all sciences is important – the academies are there to provide advice on science to policy. We can see the amazing aspect of us as nature studying itself – homo technologicus – it is frightening, but also a success of evolution and nature. The things that we are doing are imitations of the success of nature and the role of museums, in charting these transformation and links. Think about the energy consumption of human brain vs data centres. Museums are the critical in transformation of this knowledge. It was noticeable how the theme of science under attack, the risk of irrationality, and the solution to it with more science communication was common to the speeches. Brad Irwin (The Natural History Museum, London) opened the session – talking citizen science, citizen science has got an increasing role in science and engagement, and we have seen new professional societies, activities, and conferences – so what the future holds? Robert Dunn NCSU – citizen science in the wider context. For example, in anatomy, Galen in early Rome, as a doctor of to gladiators he was starting to make sense of anatomy. While the details were not clear, but the fall of Rome – the next 1000 more forgotten than what was known. With the Renaissance, there was an assumption that the ancient knowledge was correct, and the beginning of understanding that we need new discoveries. Much of what we do is about showing what was already known. Citizen science is to engage people with what is not known – with 20 million animal dissections in class, of which none led to data recording. We also don’t have knowledge of species. Rob’s lab focus on the species that are leaving near us and with us – each breathing bring 1000 species into the lungs. By working with 1000s of students in the class – the outcomes, as related to scientists and the delivery of real science in the context of a museum in which there is sometimes an open, passive-aggressive warfare. Projects include dissecting and learning about the anatomy of humans and animals guts and discovering new things in the process. What is exciting is a collaboration with the museum, from things that scare us to things that we love – sourdough bread is a place that provides a wide range of discoveries. The potential of wide Europe projects – what makes these projects succeed and expand. Karsten Elmose Vad Senior Consultant The Natural History Museum of Denmark – The NHM in Copenhagen is part of the University of Copenhagen. Two projects, We want to link both ways – citizen doing science which means real science and the linking scientists to the public – public scientists. The Real Science project is for high school students, about eDNA in water sampling. Students are collecting data and analysing the data, and they develop and test new eDNA systems. Students are excited to see a link to research. The evaluation shows that students are motivated by that it makes sense, that it is linked to science and use of data, and it is not just made for students to try. The Ant hunt includes real scientist, doing real research, with real experiment and questions. No tradition of post-school education – Julie, the scientist (PhD student) when around and met participants – and the person who writes back the thank you. Out of 75 responses from participants – about 65% find that it is important to link to scientists and value to have a role model. How close can we get to link citizens and the scientific process and how far we put the scientist in front of the campaign? Where citizen science in the next 10-15 years? Caren – citizen science is evolving into discovery and decision making, and that is needed in smart cities, Internet of Things, etc. We should make them intentional and get them into other areas. Rob – becoming institutional – from schools and universities that integrate it throughout education and that is hard, but it might become with flagship institutions that need to do that. Another part of it, is that tools for discovery are becoming very cheap and how citizen science uses them will be important – e.g. sequencing of DNA is changing rapidly, and when it’s going to be very cheap – same for camera trapping the world, or how we address and build on that is important. There are issues of pollution monitoring and sensors when low costs sensors will become reliable – this will change the very small area. Agriculture: there is the potential for using the new sensing capabilities. Karsten – the scientist role in this need to change, and in that way, we need more scientists that are willing to do citizen science. The Copenhagen university mentioned citizen science in its strategy briefly but it is an issue of how to change them. Caren- Scientists need to make a mind shift on how they engage, and they need the skills. Rob – the skills that are needed will make them better scientists in general. We will end with a better scientist. Brad – how do you change the culture? Very slow transition? Caren -In NCSU there is a buy-in from all levels, but in the people that come into science will drive it. Q&A – Polish experience: running citizen science in science centre – one where the participants are real scientists, a small number, on the other hand, citizen scientists as just data collectors – you told me that I’m a citizen scientist, this is just data collection. The more scientific it is, the more there is a need to adapt and change the project, and keep the scientists and participants along the same route is hard to manage and run. How to create projects at large scale as real scientists, beyond collecting data. If they only have done the data collection, and not in the analysis, they complain about the experience. Rob – the more quickly we can relate the data collection relate to the wider study, this helps. Also can do a more advanced style of studies, with a small group of participants and have an onlooker effect. Caren – thinking about different levels, and gives a way to allow people to engage at a higher level. People who participate in prototype feel that they don’t feel that they do real science, and it is hard to convince them that. Museum and science centre are places where you don’t expect to do something new – even with scientists who work behind glass, some people think that these are real scientists and not actors. Putting on information – showing the stories of discoveries by scientists is something that needs to communicate. What is the place of citizen science in museums there is a role of engaging in environmental challenges, and it is not clear what the museums need to engage with societal issues? Caren – museums are still seen as trusted organisations, so discussion about technology and science policy are done in museums. Rob – one model of what museums can be about. Citizen science from researchers perspective, education, but what about empowering people and addressing local problems – a coalition with engagement organisation (e.g. Science Shops) can be important. It can be promising. Another question – who is owning the definition of what real science is, and a lot of visitors feel that it is far away, and the scientists are keeping their position. Need to bridge perceptions of participants and scientists are lots of time data collectors. Are there other examples of addressing questions that the public participates in the question? When we collect information and other forms of knowledge that can be included in science? Rob – linking to food is an opportunity to engage and build on what people know, and demonstrate wider forms of knowledge. People can taste the results.